My first 3D printed Rolly Bot design is a work in progress. The printed plastic parts work well enough that I want to move on to designing a user friendly PCB as part of the design. As you can see in the photo of the yellow Rolly Bot the current UNO and wiring are a functional mess; I have a bit of work to do. 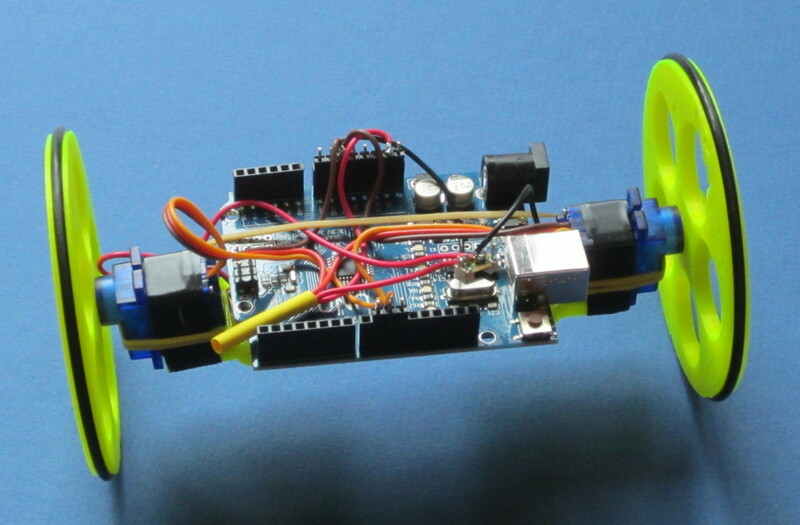 The Rolly Bot consists of two model airplane servos that have been modified for full rotation. 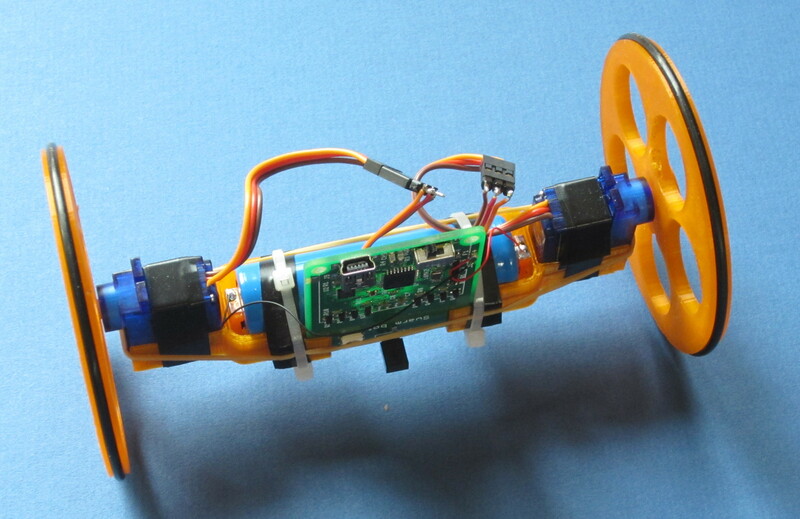 The servos directly drive two 3″ wheels either forwards or backwards. Computer control is provided by an Arduino UNO using the Servo library to control the motors. The power system uses a beefy 18650 LiPo rechargeable battery which has a 2700mA/hr capacity. The battery becomes part of the frame and when I get the PCB design completed it will be charged via the USB interface. Each time you plug the Rolly Bot in the battery is recharged. The second Rolly Bot design in orange improves on the strength of the original design and adds supports for the PCB. It still requires tape and elastics to firm it up hence the third design. The third body for the Rolly Bot includes a 3D printed plastic spring to hold the battery in tension. Again I addressed a few strength issues so I’m quite happy with the printed parts. After hacking the servo motors for full revolution I notice that it is difficult to get the servos to stop unless you tweak the software center points where the servos should be in a resting position. I also notice that this can drift slightly as the battery discharges. Currently I am just adjusting the code on each Rolly Bot until it sits stationary but I think I will add two potentiometers that will allow me to physically adjust the servo resting position. That is the potentiometers will feed the Arduino ADC and depending on the voltage I will either increase or decrease the servo set points. From a cost point of view I may also skip the potentiometers in favour of using the IR remote control to set the center resting position.